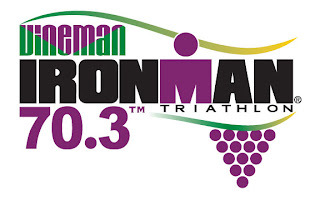 Vineman is held in Napa and is part of the official Ironman 70.3 Series (Half-Ironman). I had the chance to ride the cycle course a couple times and still fresh in my mind from yesterday. 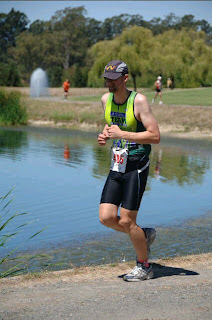 I felt relaxed going into race knowing it was not race, but really just another day of training, albeit with timing chips, competitors and of course photographers. It was a early start to the day, my wave started at 6:54am, the hotel we were staying was about 45 minute drive away which meant a 4am start to the day (talk about racing tried:). 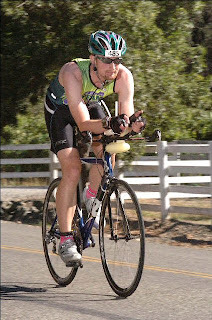 The race begins in Guerneville and the Bike to Run transition is in the town of Windsor about 10 miles away. Glad to be out of the water I geared up for the bike, the exit out of transition was a very short but steep hill, I found myself stumbling to get on to my bike and up the hill at the same time, so I did what the smart people were and run it up, then jumped on. The cycle course was mainly flat with only a few hills to be concerned and my goal was the same as on yesterday's ride to keep a consistent pace and my heart rate steady. 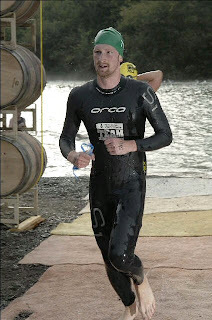 Of course at the beginning my adrenaline was high and I'll wanted to do was pass people. With the starting Age Group waves being random and my swim being a little slow there were already a large number of people out on the course. I managed to catch up and pass a couple of my teammates who I started the swim with alongside me, with average speed of 21mph this was the best ride I'd ever had on a Triathlon. I managed to keep my heart down as much a possible on the ride, only hit my peak on the final hill. The course was great though a couple tour buses did prove to be an obstacle on a narrow part of the road.